Grzegorz ‘Gabz’ Domaradzki, who started his career as an illustrator and graphic designer, has evolved his art over the years with a focus on keeping his work intriguing and captivating. Putting pen to paper, Gabz designs by hand before perfecting his work digitally. Gabz has lent his artistic style to several iconic franchises including Star Wars, Batman, Iron Man, and many more. U.S. based artist Kevin Tong has built a name for himself over the past decade through his intricate portrayal of mainstream entertainment. His portfolio includes work throughout the film, music, and book universe including work for The Black Keys, Mulholland Drive, Aliens, and most recently Akira Kurosawa’s RAN. 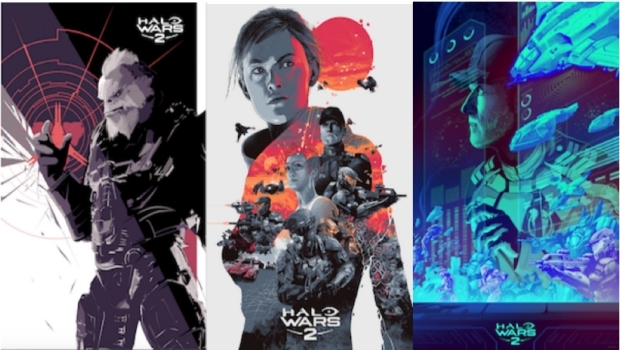 If you are interested in a print of these amazing pieces of art, keep an eye on the Twitter accounts for Halo or Xbox for a chance to buy (or even win!) limited-edition prints of all six. Halo Wars 2 is the long-awaited sequel to Halo Wars (if that wasn’t readily apparent), but comes with it the chance to play on Xbox One or PC, as a single purchase grants access on both at no additional cost. Stay tuned for our continued coverage, but make sure you check out our hands-on preview from Travis Northup (with accompanying video) while we wait for the worldwide launch on 2/21/17.